WHO PUT THE POPPY ON YOUR LAPEL? MADAME ANNA A. GUÉRIN DID. As mentioned previously in Chapter 6, New York newspapers hit the streets on 12 May 1921 reporting on the suit filed by Mrs. Mercedes McAllister Smith – for damages of $200,000 in the New York Supreme Court against the following people: Right Rev. Bishop Herbert Shipman; Maurice Leon (member of law firm Evarts, Choate, Sherman & Leon); George W. Burleigh; Bronson Batchelor; Barry N. Smith; Roger B. Jenkins; & Anna E. Guerin. The charge was that defendants had “conspired to injure and destroy her good name and disqualify and discredit her in certain patriotic and charity work.” It was reported that Miss M. M. Smith had held the post of American and French Children’s League’s Committee Chairman in New York State and was also Americanization Committee Chairman within the patriotic ‘American Defense Society’. It would be another ten months before this case was finally thrown out, because Mrs. Smith could not provide the evidence requested by Justice Bijur. Madame Anna Guérin must have been relieved to hear that news, as would her co-defendants be. In her 1941 Synopsis, Anna Guérin wrote: “Here, I do not speak about the law suit that a Mrs. Mac Allister … … made to The Ambassador of France – Mme E. Guerin Originator of the Popy’S Days Bishop Manning of New-York and Mrs. Irenee Du Pont, law suit that she lost naturally , but in which , at the Court they called me Mme E. Guerin , the Originator of the National PoppY’S DAYS in the U. S. and Allied Countries”. When Anna Guérin needed a new Veterans’ partner, because of the interchangeable relationship the American Legion experienced with the poppy and daisy after their October 1921 convention, the ‘Veterans of Foreign Wars’ became the association which stepped into the breach. Once Anna Guérin was secure in the knowledge that the V.F.W. ; the V.F.W. Auxiliary; and others were entirely capable of carrying out the May 1922 Poppy campaign, she left for France, to oversee manufacture of the 1922 campaign’s poppies. 2) A departure from New York, on 20 May 1922. Anna Guérin may have been on board the White Star Line ship ‘S.S. Majestic’ – bound for Cherbourg, France: accompanied by high-ranking members of the ‘Veterans of Foreign Wars’. The V.F.W. men were heading for Paris, to attend the Memorial Day ceremony – Anna Guérin did attend this ceremony with them. As mentioned in Chapter 8: “THE ALLIED NATIONS SAY “AU REVOIR MADAME GUÉRIN” (under USA), it is believed that Anna Guérin’s American-Franco Children’s League may not have been dissolved “early in 1922” as reported. Regardless of whether this assumption is accurate or not, Anna continued to be part of poppy campaigns within some of the First World War allied countries. For instance, she was definitely involved in arranging poppy supplies for Australia and New Zealand until 1927 and 1929 respectively. Anna was in charge of the 1922 Poppy Day arrangements in Canada, for that November’s commemoration. The bulk of the poppies was made by unemployed ex-service men within Canada, with the small balance coming from Madame Guérin’s French widows and orphans. Perhaps this could be called the ‘beginning of the end’ of Anna’s hands-on involvement with poppy campaigns. In her hastily written 1941 Synopsis, Anna wrote about her 1922 US Poppy Day campaign, where the veteran organisation helping her had been the ‘Veterans of Foreign Wars’. She also mentioned bringing 2 million French-made poppies into the USA in March 1923 – ordered by the American Legion, for their 1923 Memorial Day poppy drives. In 1924, the American Veterans began making the poppies to be distributed in the U.S.A. (See Chapter 8). During April 1924 (12th & 24th), the Hastings and St Leonards Observer in England carried advertisements for a “Madame Guérin” offering French lessons. This lady lived at 38 Parkhurst Road, Bexhill, Sussex. The advertisement offered: Private lessons; classes; and preparation for all exams. Perhaps this was Anna Guérin popping back to Britain for some occasional work … or maybe not. It is best to record it here, just in case. From 1924 onwards, until the Second World War began, Anna Guérin sailed into New York twice a year (on average). Sometimes she had come from Vallon, sometimes Paris. Sometimes her visas were issued in Marseilles, sometimes Paris. Apart from those Second World War years, it appears that Anna had a foot-hold in both the USA and France. In February 1925, Anna was with Juliette in New York (at 45 West 55th Street, NY), when Eugéne arrived on St. Valentine’s Day to stay for a “15 day” holiday. On 9 January 1926, Eugéne joined Anna again for a month. In 1918, one million of the cream of American manhood went to France to defend America; many did not return. Those who did return carry memories of war, not all glory as we are prone to see it, but as a horrible, screaming hell. And now, years later, one views the battle fields of Flanders, brilliant with acres of red popies, fertilized with the blood and flesh of our boys who are still “over there.” Several soldiers who are now recovering from wounds and sickness but are yet unable to do strenuous work, try to earn their own living by making poppies such as those in Flanders. The wearing and making of the red poppy is a beautiful idea, originated by E. Guerin with the assistance of Commander Galbraith. Madame Guerin was impressed by the fact that the French peasants believed that the poppies of Flanders were thick and red because of the blood spilled there; the theory of the peasants is undoubtedly true. She thought that it would be a great honor to the dead for each person to wear a poppy on his breast the Saturday before Memorial day. At the Annual American Convention of 1921, Madame Guerin assisted by Commander Galbraith persuaded the head of the organization to accept the idea of having our wounded make these poppies. The idea was accepted and each year the output of poppies increased. Accordingly, each year the funds of the American Legion increased. The red poppy has now become almost universal among the nations of the Allies. The output of the British Legion is from twenty to twenty-five million each year, and this legion claims that most of the support comes from the red poppy sales. One of the main reasons that the poppy sales have become such successes is that the motive behind them is so good for all concerned. The wounded soldiers are given one cent for each poppy they make. The number of poppies per djem[?] for each soldier is kept down to four hundred, this enabling a soldier to make four dollars a day. These maimed boys take a great deal of pride in making poppies, for they know that they are actually making something that everyone wants. One-fourth cent is given for each American Legion label atached. In connection with the making of the poppy I will mention briefly the selling and disposal of the money. The poppy is shiped to different American Legion stations, where volunteers sell them. No money in exchange is asked for the service rendered, and the sellers ask a price of anything from five cents up. The money and the poppies help Legion who distributes it this: ten per cent to child welfare of the wounded veterans, one third of the remainder goes to the Veterans’ Relief Fun; the remaining two-thirds go to the Unit Rehabilitation. Up until 14 November 1935, Anna had been giving her husband Eugéne as her next of kin for the passenger list documentation. However, on 01 December 1938 (when she was next found travelling), Anna gave daughter Raymonde as next of kin. Either Eugéne had died during that 3 year period or he and Anna were separated. Anna opened a French antique business in New York – probably the reason for her regular visits – it is not known when this business began. Sister Juliette and friend Blanche managed it and this is borne out in the 1940 Census (taken 01 April 1940) because both women are listed as a Manager, of an Antiques business. They were living at 200 E 60th Street, New York and this street has, incidentally, a reputation for being “an antiques row”. Certainly, after the war, it has been known for its antiques’ shops. Such an operation, to ship items over from France into the USA, would not have fazed Anna, given her experience of arranging to ship millions of poppies around the world. On 03 September 1939, Great Britain, France, Australia and New Zealand declared war on Germany. It is believed that Anna Guérin was in France at the time the US 1940 census was taken. She can be found leaving from Nazaire (on ship ‘Champlain’) on 19 May 1940, heading for New York. In June 1940, Germans entered Paris and France signed an armistice with Germany. It is thought that Anna spent all the World War Two years in the U.S.A.
On 09 February 1941, Madame Anna Guérin wrote a Synopsis “of the history of the National Poppy’S DAYS for Decoration day”. It was sent to Moїna Michael and confirmed all that had been discovered during research and noted about the Poppy Days and Drives. However, it also included a few previously-unknown points of interest and this enabled some sections of the timeline to be expanded a little. The Guérin Synopsis is held within Moїna Michael’s papers at the State of Georgia Archives and is available to the public. On this occasion, the Synopsis was gratefully received from Barbara E. Walsh, with permission from the Michael family. In the 09 February 1941 letter which accompanied her Synopsis, Madame Guérin wrote: “… I am going to start a great work for England which will, very probably, take me to all the places I have been lecturing from 1914 to 1922 …”. The nature of this “great work for England” is, to date, unknown. In mid 1942, Anna was found dabbling in a new war-related venture. She applied for, and was granted, a US patent for four designs of stoppered bottle. Nothing appears to have come of her idea though. “BOTTLE OR SIMILAR ARTICLE”. Page 203. Application filed July 27, 1942. Patented Dec. 7, 1943. 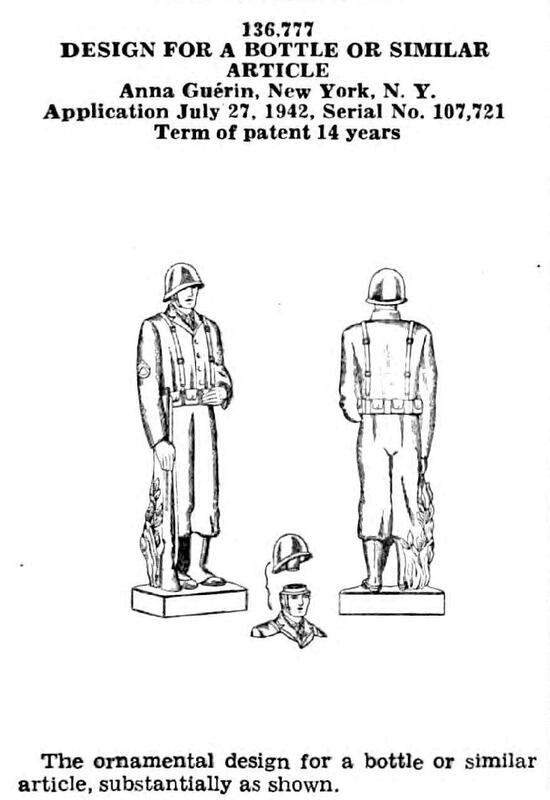 Credited: http://babel.hathitrust.org/cgi/ptid=wu.89047002449;view=1up;seq=215; Original – University of Wisconsin; Digitized by Google; US Patent and Trademark Office http://www.uspto.gov; IFI CLAIMS Patent Services. “BOTTLE OR SIMILAR ARTICLE”. Page 204. Application filed July 27, 1942. Patented Dec. 7, 1943. Credited as above but with link: http://babel.hathitrust.org/cgi/pt?id=wu.89047002449;view=1up;seq=216. On 23 March 1945, an interesting article appeared in the Scottish newspaper ‘Daily Record’. It was highlighting the plight of children in devastated France … history repeating itself, in a Second World War. It reported that the French “Ambassadress Madame Massigli, visited Glasgow to accept the gift of a mobile kitchen unit for relief work in devastated France” and described the outfit being worn by her, including the hat. An image of Madame Massigili accompanied the article and she is wearing a remarkably similar hat to that worn by Madame Anna Guérin during her fundraising and poppy campaigns. Curiously, the article also mentions a “Madame Guerin”, who had arrived in Scotland – she is described as wearing a similar hat too but it is not thought to be our Madame Guérin. Another distinguished Frenchwoman present was Madame Guerin, who arrived in Scotland only three days since from Sweden. In Helsinki when Finland came into the war she eventually managed to find refuge in Sweden. She is living in Ayr with her two children. Her husband, who has had important diplomatic posts, is expected here soon. She, too, favoured an excessively high hat. As has already mentioned, it is believed that Madame Guérin spent all the World War Two years in the U.S.A … the proof being that, after the war was over, she is known to have left the U.S.A. in July 1945 and she is found arriving back in New York on 29 November 1945. Her return journey was on 21 November, from Le Havre on the ‘Edmund B Alexander’, on 21 November. The ‘Edmund B. Alexander’ Ship Passenger List notes numbers in the “Immigration Visa, Passport Visa or Re-Entry Permit Number” column and notes that it had been issued in “Phila” (Philadelphia) on 02 June 1945. For the return voyage to NYC, the Passenger List noted: her occupation was “Lecturer”; her last permanent address was “New York City”; and she was joining her sister Juliette at “257 3rd Avenue, New York City”. She had not stayed long at all in France. After the Second World War ended, Anna sailed backwards and forwards between France and the U.S.A. In France, she would usually stay in Paris or at her home in Vallon (-Pont-d’Arc), which her daughter Raymonde lived alone in after Anna died. It would appear, that Raymonde had lived in Ruoms, Ardèche previously – approximately 9 miles from Vallon d’Arc. 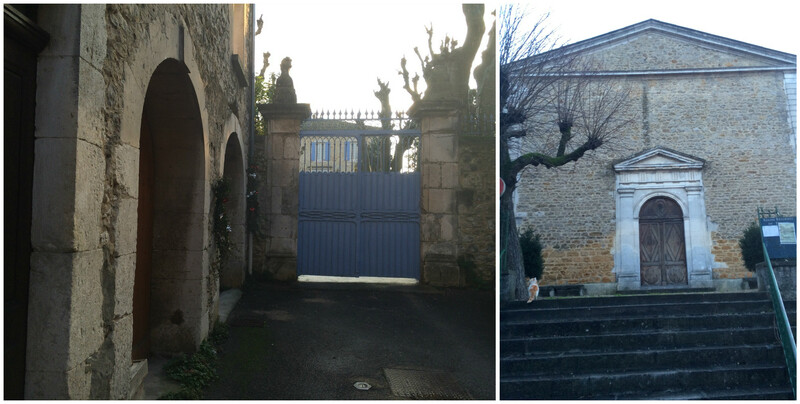 Above: Left, Anna’s home in Vallon can be seen behind the gates. Right: The nearby Protestant Temple. Courtesy/© of Thouard/Boulle Family. From 1946 to 1956, Anna took to flying into New York from Paris twice a year (on average) – in these years the Flight Manifest gave her US residence as “957 3rd Avenue, New York. So it can probably be assumed that she still had the antiques business to oversee – or had it for part way through (until c1950?) and, then, continued to visit her sister Juliette Boulle in New York twice a year. 5 square Charles Dickens, Paris. Madame Guérin’s daughter Renée lived in one of the apartments on the four floors above Musée du Vin. 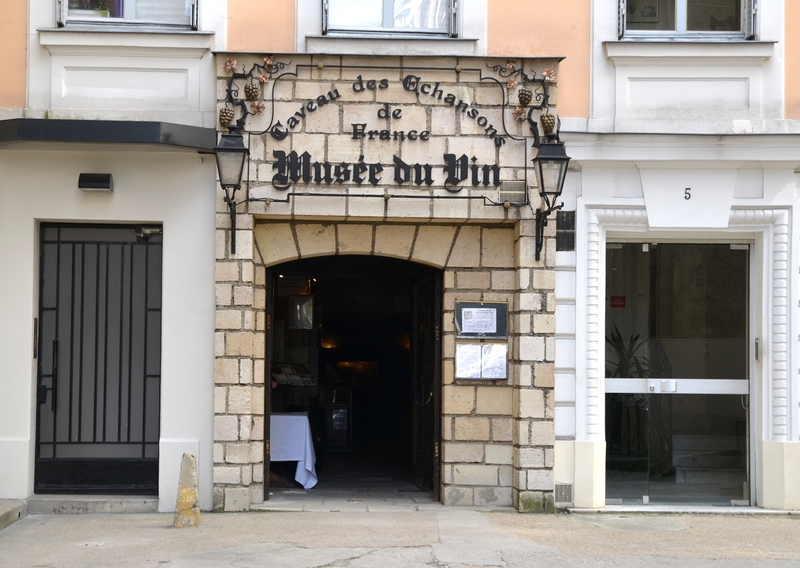 Image courtesy/© of Musée du Vin, 5/7 Square Charles Dickens, Paris. 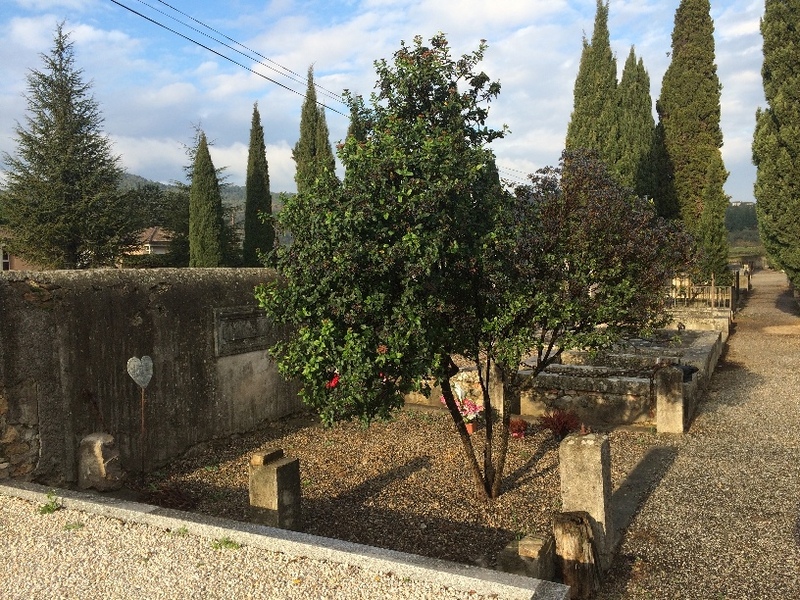 The Communal Cemetery at Vallon (-Pont-D’arc). Madame Guérin’s remains or ashes may be interred here. Courtesy/© of Thouard/Boulle Family. THUS, THE LIFE OF A REMARKABLE WOMAN CAME TO AN END.